A number of successful experiments and complete works incorporating motion capture have been done in the period since we acquired the PhaseSpace system. Some of those can be seen on the CalArts video page. In 2013 we organized our first annual exhibition of the Mocap for Artists course which was installed in the B&W Gallery. Isabela Dos Santos installed her Mini Bunny Cabaret Show on a tablet computer screen mounted inside a small proscenium theater sculpture. Alex Santa Cruz, Guyeun Kwon, and Kyoung Joo Kim exhibited their works in a looping compilation displayed on a 55″ flat panel screen. 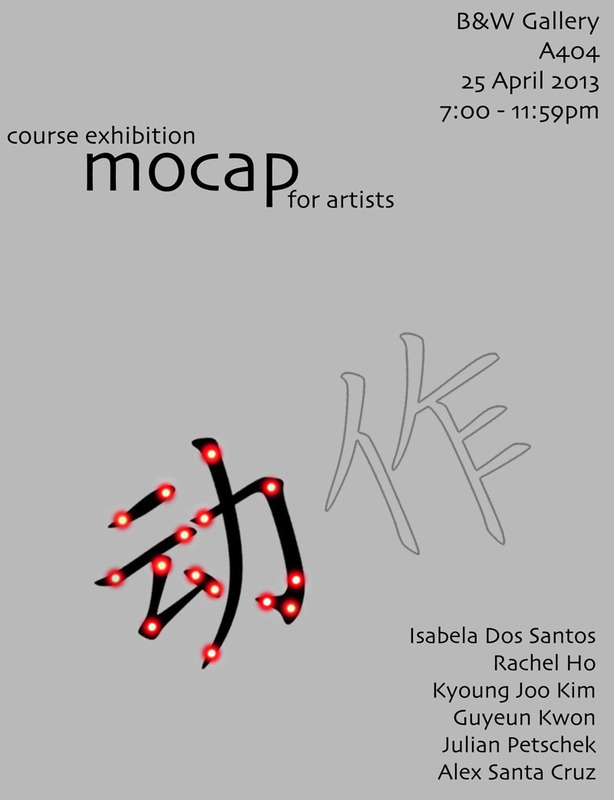 Rachel Ho and Julian Petschek collaborated with Robert Gordon on the real-time motion capture based performance piece, Mo Cap Mo Problems. This promotional excerpt is edited from the full fifteen minute performances which took place every hour on the hour during the evening of the exhibition.